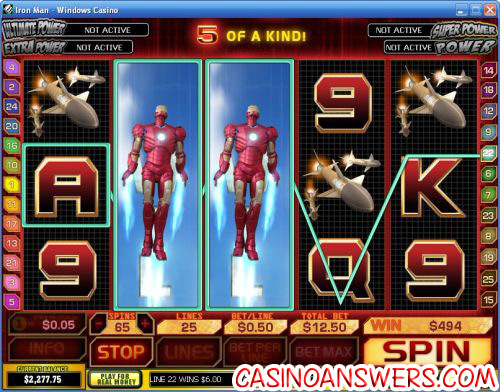 Iron Man Movie Video Slot Guide & Review - Casino Answers! Iron Man is a 5-reel, 25-line Marvel video slot based on the popular 2008 blockbuster film starring Robert Downey, Jr. as Tony Stark. It features a Missile Attack bonus game, Expanding Wilds, Mixed Pay and a Marvel Multi-Level Progressive Jackpot. You can find the Iron Man movie video slot at Playtech casinos such as Windows Casino.Play at this years #1 online casino for United States - Slots.LV. Bets can be made in increments of $0.01, $0.05, $0.10, $0.25, $0.50, $1, $2 and $5. You can change the bet per line to up to 10X those amounts, meaning the maximum bet is $50 per line or a total bet of $1250. For the ability to bet from a single penny per a spin to well over a thousand dollars, Iron Man makes a great slot to play for penny pinchers as well as high rollers! The two Iron Man symbols appear on all five reels and are placed one on top of the other on the reels 2, 3 and 4. After a spin, if you are able to get three matching Iron Man symbols on all three positions on a single reel, they are considered Wild symbols and can stand for any symbol with the exception of the Scatter symbol. There are four Progressive Jackpots in Playtech’s Iron Man video slot. Iron Man is linked to four Mystery Progressive Jackpots: Power, Extra Power, Super Power and Ultimate Power. All four jackpots are won randomly. Any spin of any amount in the Iron Man video slot can win entry to the Jackpot Game including spins with no game wins. The higher the bet you make, the greater your chances are of entering the Jackpot Game. Entering the Jackpot Game will guarantee you a win of one of the four progressive jackpots. The Iron Man Jackpot Game has a 4X5 grid of 20 squares hiding different jackpot symbols. Click of the squares to reveal jackpot symbols. Your goal is to match 3 identical jackpot symbols to win that jackpot. The Jackpot Game has a reaction timer, so that if you take too long to react, one of the jackpots will be paid out to you. Iron Man features a bonus game – Missile Attack Bonus. You have to shoot down missiles to win cash prizes, free games and a free games multiplier. If you win both free games and a multiplier, prizes are collected and your free spins will begin. If you get three Scatter symbols (Iron Man logos) during your free spins, you will 10 more free spins. You can win an infinite amount of free spins. For those who wish to be dazzled, Iron Man has some excellent graphics, animations and sounds. For those who want to win some extra scratch, Iron Man provides that in spades. Or, if you’re just an Iron Man fan and you just want to have some fun spinning a few reels, Iron Man might just be the right choice for you as well. 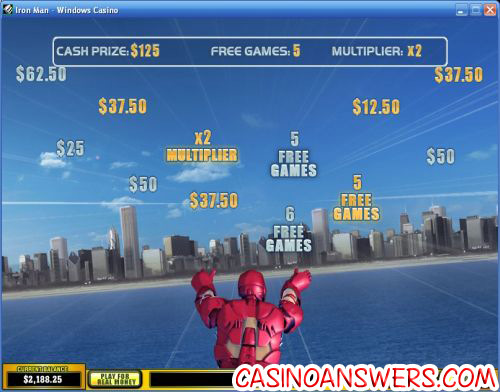 Give the Iron Man video slot a shot at Windows Casino! Does the Iron Man movie slot machine have any Progressive Jackpots? The Iron Man slot found at Playtech casinos such as Windows Casino has four Mystery Progressive Jackpots that are won randomly. Any spin you make can win, but you can increase your chances of winning by making a larger bet. Where can I play the Iron Man Slot Machine? What Marvel Slots are there?